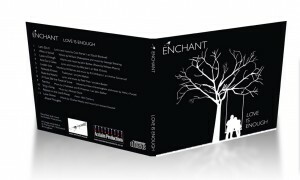 Make your wedding a special occasion with music from Enchant. Whether it is at a church, registry office or hotel, Enchant can be the perfect group for your special day. We can offer all types of options. Whether it is singing songs before the ceremony, supporting congregations in their singing of hymns in churches, singing the entrance and exit music or most commonly singing to the guests during the signing of the register. Our conductor will even bring his own digital piano along for the performance to accompany the choir and to use if piano music is required in other parts of the wedding. Our repertoire for weddings is extremely varied. From madrigals to jazz, musicals to pop ballads. If you have a particular song you’d like, we’re happy to discuss that with you. Examples of previous pieces we have performed for weddings can be found on the Listen to Us page. Costs start from around £200. Contact us to ask for a quotation.